IBM will reported earnings after the closing bell on Tuesday, January 18. For traders maintaining a position in common stock during earnings releases and the frequent price gyrations can result in uncomfortable moments. Earnings releases for the options trader do not force us to take a position in which we must correctly predict the direction of price action stemming from the earnings release. By exploiting the typical changes in option pricing that reliably and reproducibly occur as earnings approach, it is possible to establish a broad potential range of profitability that extends for a considerable distance both above and below the current price of the underlying. The core point of understanding is to recognize that implied volatility (IV) reproducibly increases in the series of options that will expire after the impact of earnings has been reflected in the price of the stock. Using the standard option pricing models, IV is directly correlated with option prices being “rich” or “lean”. In the specific case under consideration, IBM monthly options will expire this Friday, January 21. A further predictable characteristic of this IV increase is that this juiced IV will drop substantially and rapidly following the release of the earnings and the reaction of price of the stock to this event. Armed with this knowledge of the characteristic behavior of IV, let us consider a trade to exploit this predicted sequence of events. The trade structure we will use is that of the “double calendar spread”. This spread is established by selling the front month options with the juiced IV and buying longer dated options with lower IV. The fundamental rationale for this trade is that we are going to sell “rich” option premium and buy normally priced premium. As highlighted by the ellipses and horizontal arrows, it is clear that the predicted increase in IV has occurred and there currently exists a horizontal volatility skew. The next step in understanding this trade is to check to be sure the historic range of volatilities which are typical for this underlying. 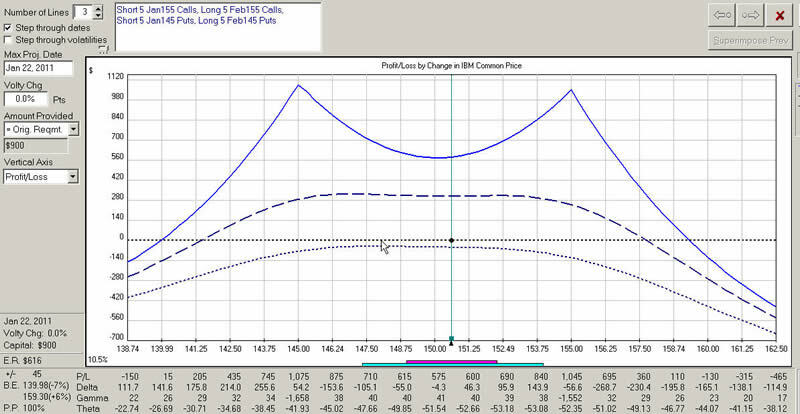 Below is an embedded daily chart of the implied volatility. When considered together with the first chart of current pricing, it is clear that we are selling rich premium and buying more normally priced premium. As can be seen from the graph, the trade has breakeven points of 139.98 to 159.30. The magnitude of the predicted move can be imputed from the price of the at-the-money option straddle. That analysis gives a range of 145.90 to 154.10, price values well within the profitable zone of the trade. What are our points of risk on the trade? Risk comes from two sources in a trade such as this: price and IV. If price exceeds our breakeven points, the trade will be unsuccessful. If IV of the long legs collapses more than projected, the trade will produce losses. Risk is crisply limited to the amount paid for the trade; you cannot lose more than the capital invested. This is an example of a controlled risk trade seeking to capitalize on well recognized relationships between an earnings release and option pricing. This is not a “gimmee” trade, but represents a reasonable risk:reward situation. As with all trades, it is presented for educational purposes only and does not constitute a recommendation.